Most people know what a betta is, it’s a Siamese fighting fish. Despite popular belief, a betta cannot live under a plant and eat strictly the roots. These fish are often treated horribly in captivity. The fish will reach around 3-4 inches in captivity. These fish can never be with another betta. 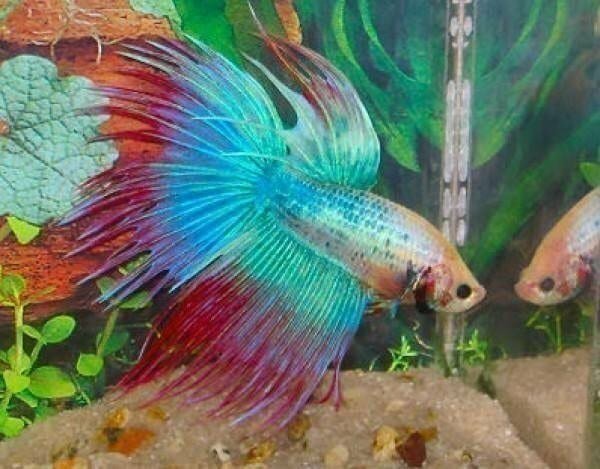 Two male bettas will peck at each others’ fins until the blood vessels leak and the fish bleeds to death. They are easy fish to take care of and they live to be around 2 or 3 years old. The fish are also very inexpensive and they come in a wide variety of colors. Bettas can come in all types of reds, purples, blues, and white. Males are the colorful ones that you find in the pet store in separate containers. You may think that a 1-gallon aquarium would be sufficient but you really need at least a 2 1/2 gallon tank which will cost you around $10.00 at the pet store. You can purchase these tanks at www.petsmart.com, www.petco.com, and www.petland.com. You can also buy glass tops for the tank and put a light above it. Pet stores make it seem as if bettas should be in a very small container with no bubbler or filter. Is this the way that you would like to live? Bettas should always be kept in a nice size aquarium and should be fed betta food on a regular basis. 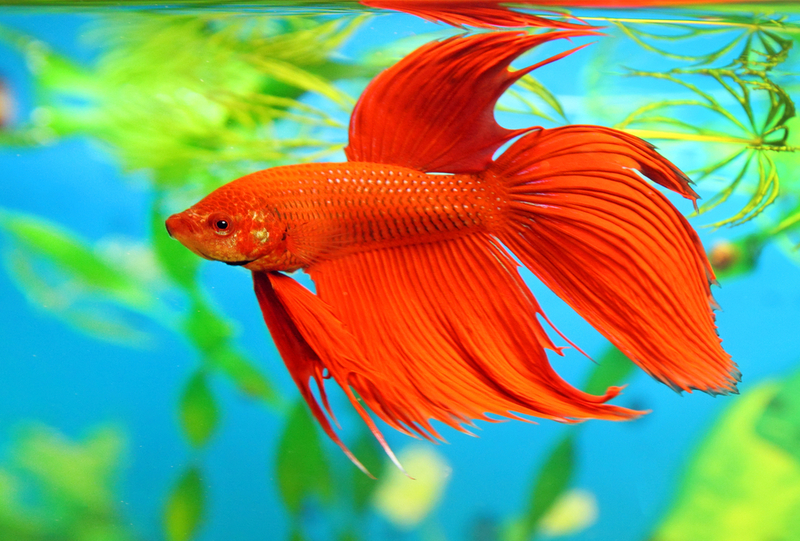 Female bettas are much smaller and their fins are also shorter. They also do not come in many different colors like the males do. There are also different types of male bettas. The fish can actually jump out of the water so they need a secure lid. I kept 2 bettas next to each other and both jumped out trying to get into the other tank to fight. You will notice that when the fish gets upset and wants to fight, all of the fins will puff up and the fish will make itself look larger than it actually is. You should never keep bettas close to each other, even 5 feet is not enough space between the tanks. Bettas make nice kitchen companions. You can place the bettas tank in the kitchen and watch the fish as you eat supper and cook the food also. They are also good pets to keep for children. Kids love fish and bettas are very colorful and intriguing. Make sure that your child is feeding the fish or take on the task yourself if you are concerned with the issue. Before purchasing a fish I would check the fish over for possible signs of disease or illness. Avoid buying a fish with white specs on it or torn fins. I If a giant bear were to stand on its four legs, it would be able to look at an average height human in direct contact with the eyes. This giant bear is called arctodus simus. Standing on the hinds will mean 12 feet height reach, the height of two refrigerators put together. They disappeared 11,000 years ago, though popular in California. II The water played home to the majority of the living creatures close to 450 million years ago. One of the phases of extinction happened at this time which altered the makeup of plants and animals till now. III 359-299 million years ago lived a huge giant fly that has a wing length of 25.6 inches to fly. This wing length affords it the holder of the record for the biggest flying winged insect creature in the world. IV The man who had the first contact with extinction cases was Georges Cuvier. At the time he worked at the Museum of Natural History. When he quit his job, he started living on the grounds after he realized the passion for his work. V Attempts to save some threatened species have begun a long time ago. For example, in Panama, there are numbers of tanks that have endangered frogs kept in it. For a frog to join its members, it must have a bleach bath. VI Of all extinction worries, the plants are the ones that have a higher rate of going into extinction mostly because of humans. Their inability to move like the animals leave them prone. A total of 68% plants species are in line from disappearing on the face of the earth.